MONTREAL, QC--(Marketwired - Apr 11, 2014) - There are many ways to help those in need. You can make a financial donation. You can volunteer. Or, if you're going to be in Montreal's West Island area on May 31, 2014, you can hop, skip and jump down the side of the Courtyard Montreal Airport. Known as a decalade, the experience is perhaps the most exhilarating fundraiser held among YUL Airport hotels to date. And it's directly benefitting a beloved local institution: Big Brothers Big Sisters of West Island. Reminiscent of both rappelling and parkour, a decalade is a convenient way to conquer the urban jungle as well as any fear of heights. The process begins at the top of a building where a person gets hooked up to enough straps so that s/he can effectively walk down the side of the building to the safety of the ground. This decalade benefitting Big Brothers Big Sisters of West Island will occur at an ideal location among Montreal's West Island hotels. 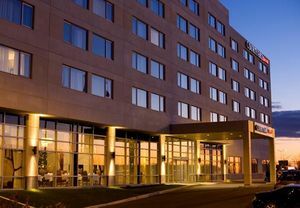 Not only is the property offering up its building free of charge, but its recently redesigned lobby makes a smart entrance to the exciting event. Participants can take a few deep breaths to steady their nerves on the chic couches and distract themselves with the big-screen televisions before heading up to the roof for a good cause. Of course, leaping off the top of a building isn't for everyone. Anybody who'd rather watch than walk can help their more adventurous colleagues by sponsoring them. The decalade requires a $75 registration fee and $450 or more in pledges from each participant. While the decalade is creative, it's not the only way the property is giving back. It will also host a dinner gala on June 5, 2014 for approximately 150 people in yet another effort to raise funds for the nonprofit organisation. Such a strong sense of community mindedness is just one more way the property distinguishes itself from other hotels near the YUL Airport. It boasts some of the most attractive public spaces among West Island hotels, thanks to its recently renovated lobby and YUL Restaurant & Bar, which features seasonal dishes that are in step with the natural materials, clean lines and contemporary feel of the restaurant's design. In fact, YUL Restaurant & Bar may just be grounded enough to serve as an ideal post-decalade gathering spot where participants can toast their bravery and Big Brothers Big Sisters of West Island with a well-deserved meal. Located a shuttle-ride away from the Montreal-Pierre Elliott Trudeau International Airport, the Courtyard Montreal Airport marries together style and comfort within every beautiful space. The 160 guest rooms, for example, include flat-screen televisions, mini-refrigerators and expansive desks with expertly positioned lighting and outlets as well as complimentary high-speed Internet access. Such thoughtful amenities make it easy for guests to maintain their routines, whether they're traveling for work or play, as do the hotel's other features, like the indoor swimming pool and fitness centre. With 5,608 square feet of event space, the hotel is also an excellent choice for conferences, weddings and special events, while the internationally-inspired fare of YUL Restaurant & Bar speak to a wide range of palates. Just as the hotel can welcome both business and leisure guests, its location is also convenient to both pursuits. The business district of Ville Saint-Laurent is nearby, while downtown Montreal's museums, attractions, shopping and dining are just a short drive away. On May 31, 2014, the Courtyard Montreal Airport is hosting a decalade and dinner benefitting the Big Brothers Big Sisters of West Island in Quebec. Don't miss out on this exhilarating opportunity to help others!